Looking for available rooms at Calpe hotels can be a problem during summer time. Most Calpe hotels are located on the outskirts of the city and offer everything from Bed and Breakfast up to all inclusive. Be aware of the huge demand during the summer months for Calpe Hotels, so do your booking early at your travel agency or via the web. At this stage I will list a few fine hotels in Calpe which have been recommended to us during a small survey with readers of our newsletter. In addition we have friends who staid at a hotel listed. So i added their opinion too. Overall as Calpe is a very well known summer resort Calpe hotels are prepared to cope with tourists and their needs. 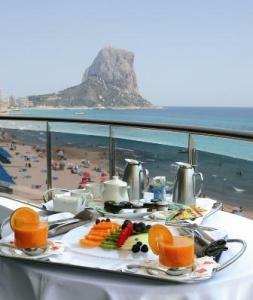 The Hotel Villa Marisol Calpe is a luxurious and cozy four start hotel located in the quiet town of Calpe. There are beaches and shops which are practically on your doorstep! Our detailed review is here. The SH Ifach Hotel is located within easy reach of all of the popular tourist attractions in the area. You can even take a trip to a theme park to keep the kids satisfied! Here are details about this very nice Calpe hotel. Check hotel pricing before and compare it to pricing on Calpe apartments which are also an alternative. In case you visit Calpe in off-season you might also want to check Calpe real estate agents, who sometimes rent out property of locals as well. As far as the hotels star-rating is concerned, you should be fine with one of the 3-star calpe hotels if you expect basic accommodation. The 4 and even the 5-star Calpe hotels will most of the time offer additional services, such as in house restaurants, swimming pool, tennis and golf courses etc. depending on the hotel. Once again, make sure you check pricing and availability of Calpe Hotels early, when you travel in summer. ...share your opinion and write a review about your favourite Calpe hotel! I am really sure, our readers whould love to hear about why you liked it so much. It is really easy to do. Just click here and write your story about your favourite hotel in Calpe?